Good day to you folks! I've promised this recipe would be typed up in time for me to bring it to church (tomorrow - I don't procrastinate much, just twice a year, and it lasts 6 months). 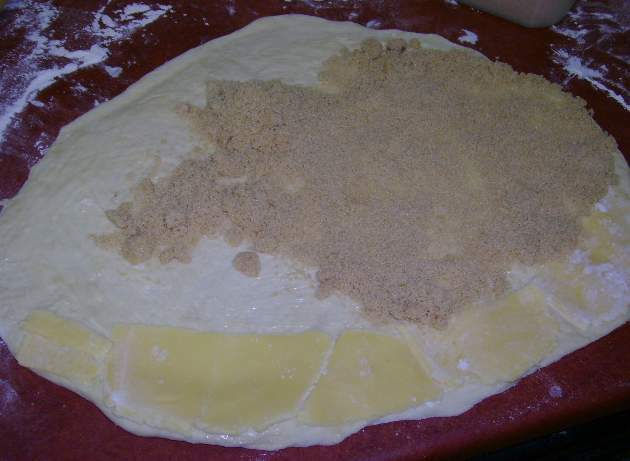 Now, you may be working with new ingredients, that's cool, don't be afraid. You can conquer the unknown. Just believe in yourself, and you can do anything! 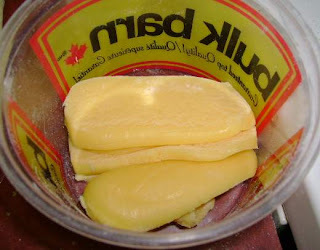 I get the almond paste at Bulk Barn, a bulk store (who knew!). Its yellow, and very sweet, and is stored in a container (near the candied cherries/pitted dates - at least at bulky barn). Growing up, I ALWAYS chose the almond croissants when I would go to Baguettes with my mom... so I had been wanting to work with this stuff forever and a day! 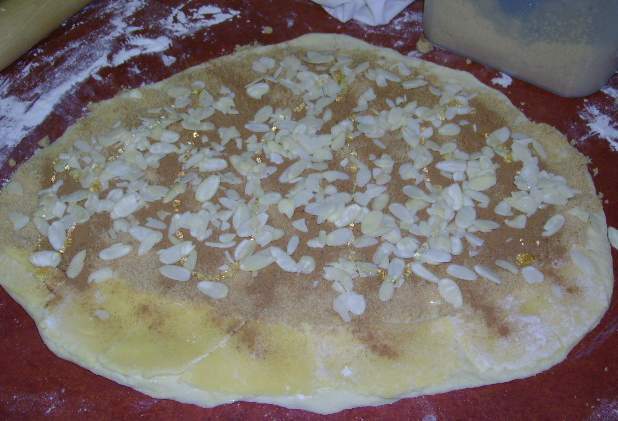 Start with rolling out the almond paste. 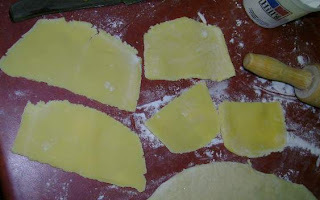 I slice ¼ “ thick slices, the thinner the better, (see picture above!) it will be less work. Sprinkle a tiny bit of flour to prevent the paste from sticking. Roll it out (work out all those frustrations when doing this, its awesome!) roll it to about 1/8” thick. You don’t want it almost transparent, but not too thick (unless you really want the rolls to be super sweet). roll out to about 1/8" thick. 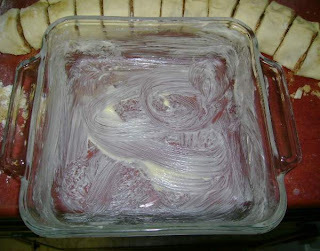 Put aside (I roll about 6 slices, and if I have any leftovers I simply return them to the tub). 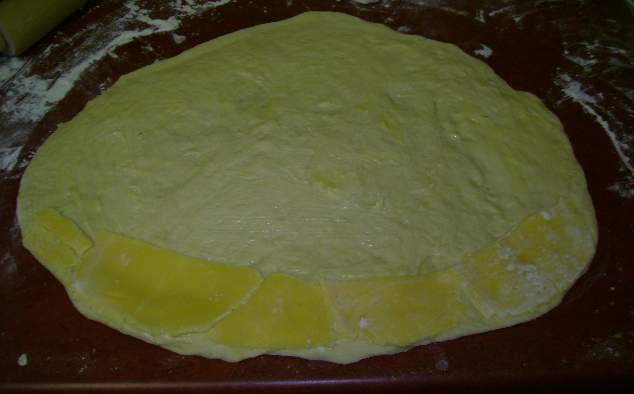 When the 1st rising is done, divide the dough, and cover the unused balls with a damp cloth to keep from drying out. Try and roll it out as rectangular as you can. Some people cut the dough, I read you should not as it cuts the gluten fibres in the bread. Whatever. Take a look at mine, this ain't a competition ok? so go with the flow. 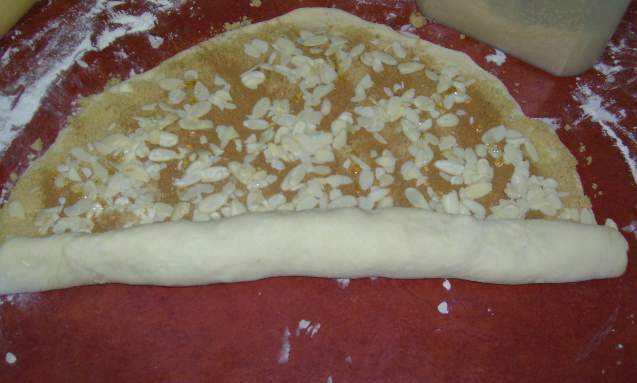 Don't fight the dough! Try to keep the long side parallel to you. Check for dry spots. Fix the dry spots! I sprinkle brown sugar in a layer (about 1/8” thick) like if you were doing nun farts (I'll post THIS recipe next time I do pies :) . Spread it out to all the edges, except that ½” that needs to remain “clean" and where the almond paste is. 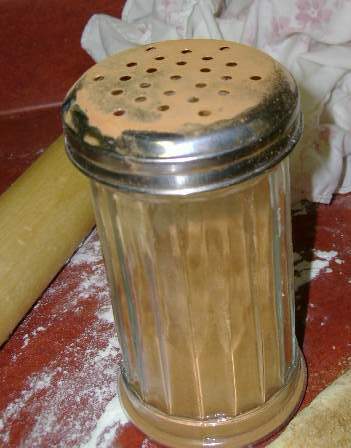 This is what I decided to use for my cinnamon shaker :) Dollar store special! 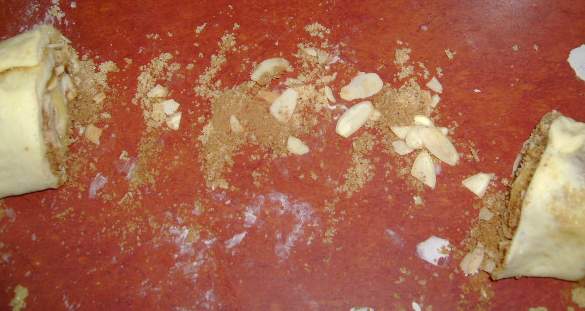 Sprinkle sliced almonds, I usually use 2-3 handfuls. Its to taste. 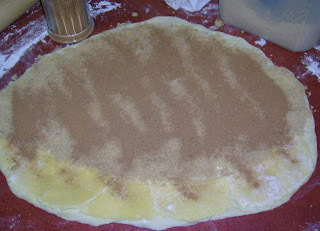 And then drizzle a LITTLE bit of honey (helps the rolls stick together) You can see almost glowing spots on the picture above, I did not use much. Now, we start rolling. This is fun. 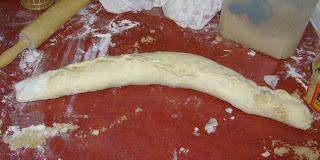 Pull on the roll GENTLY, and roll another half turn, making sure its rolled right across. 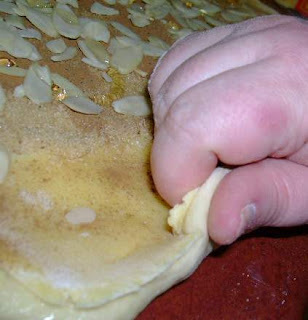 Pull a little, (this thins out the dough a bit). 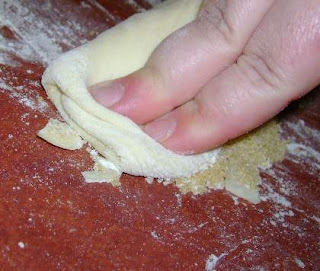 As you go, pinch the ends, so all the good stuff will stay INSIDE the roll, and roll over the “clean” edge. The ends are so good, just like that... read on :) you'll see what I mean! Place the roll, clean edge on top, and pinch the edge with the roll securely across. Smile, you’re almost done! Now, slice the roll. ½” will give you MONSTER rolls, be warned lol! So, ½ -1/4” will work well. Its up to you. far from perfect, but oh sooooo good! If you don't know where to put the weird mishappen ends, just do like I do eat the evidence. Oh come on you KNOW you WANNA! Take your buttered pans, and place the rolls, DO NOT CRAM like I did in mine (see pictures above, they turned out doughy.) 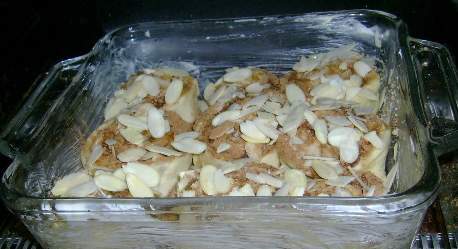 in an 9X9 pan for example, I’d put 9 rolls. MAYBE 12 if they are small. Use your judgement – experience here will tell you). 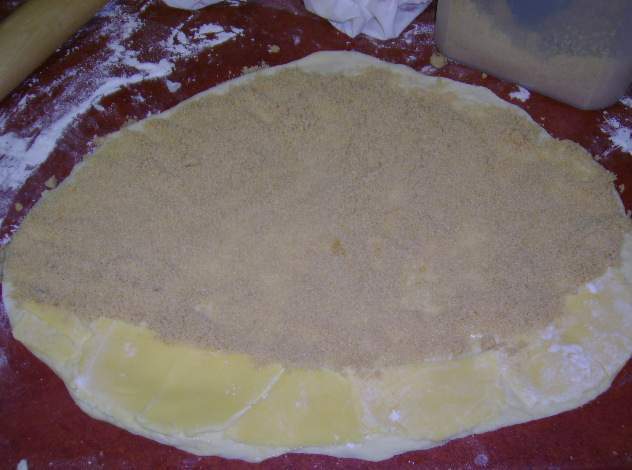 BE WARNED, they may "crumble" or be a little "loose" depending how you rolled them, try and keep them together, as much as possible. 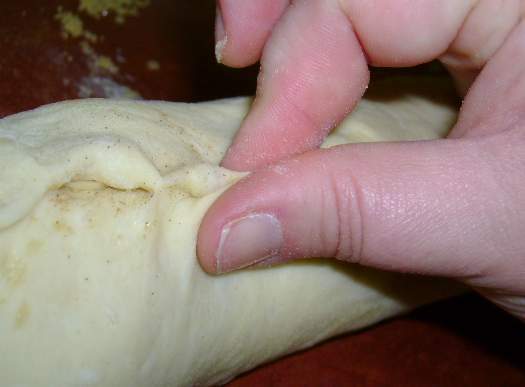 If you DO cram them, your rolls will be either doughy, tough or not cooked enough! Now hold on a second. Look at your counter... LOOK AT IT! see all this stuff? 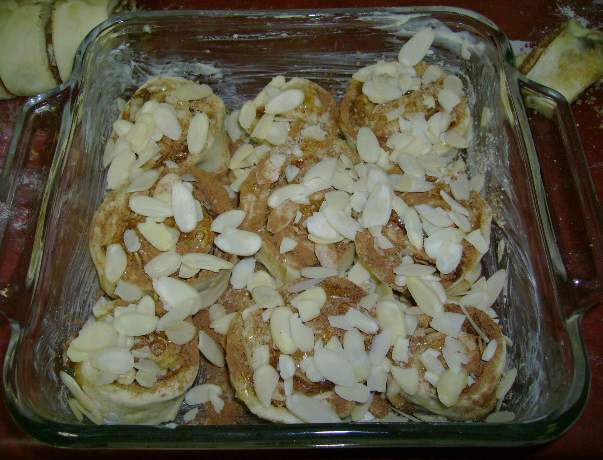 Now, sprinkle lightly with cinnamon, drizzle generously with honey, and sprinkle sliced almonds on top. Place in cold oven, turn oven on, and bake at 325F-350F for about 20 minutes -25 minutes (remember, sugar=dark rolls….) 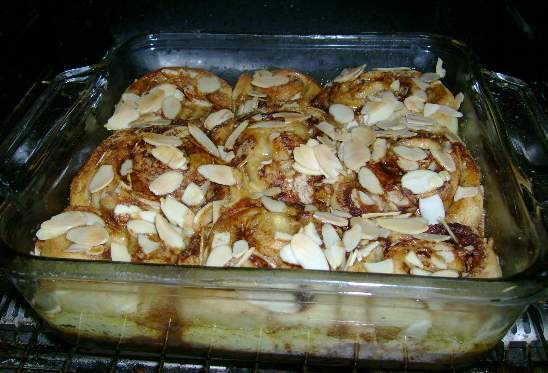 My oven is wonky, so I use a toaster oven and do these at 325 for about 20 minutes. Just keep an eye on them, you do NOT want to burn these babies k? Cold oven? Yep, to give it an extra rising boost before baking. Trust me. Let cool in pan. 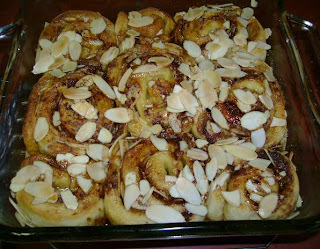 You can turn them out as for the caramel rolls, but then you’d probably want to top them with toasted sliced almonds. Provide napkins when serving. And be prepared to make more! Now, listen to this baby! 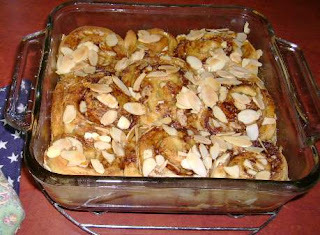 loved your blog on almond rolls,, will have to read more. Trying to raise some much needed funds!